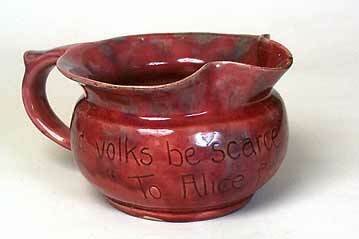 Baron Alice jug - 4¾" (120 mm) diameter, 3⅛" (79 mm) high. July 1926. We are looking for some good 'ah's when we tell you that the Pottery Studio dad has a daughter called Alice, and this is her jug. Unfortunately neither was around in 1926 and dad didn't give it to her.